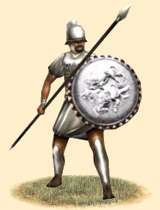 The Sacred Band is the elite infantry of any Carthaginian army and can be relied upon to do their duty to the end. The Sacred Band are an elite infantry of a different kind than the Elite Africans. Trained from a young age to be tough phalanx spearmen, these men are from wealthy Kart-hadastim families, and as such have extremely good equipment. They are trained from birth to be great warriors and they are able to afford high quality armor and weapons. They fight as a traditional Phalanx organized in the Spartan style. They are a nearly impervious wall from the front and are extremely hard to flank due to the fact that they are as proficient with their swords as with their spears. Even the heaviest cavalry is no match for the Sacred Band as long as they’re presenting their spears in the direction of their attacker. Only a flanking maneuver by heavy cavalry or heavy infantry has a chance of breaking them in a melee. They are proficient with their swords as well, often able to provide an elite assault infantry when required. Though they’re really too heavy for the role, but can excel as a shock infantry when needed.